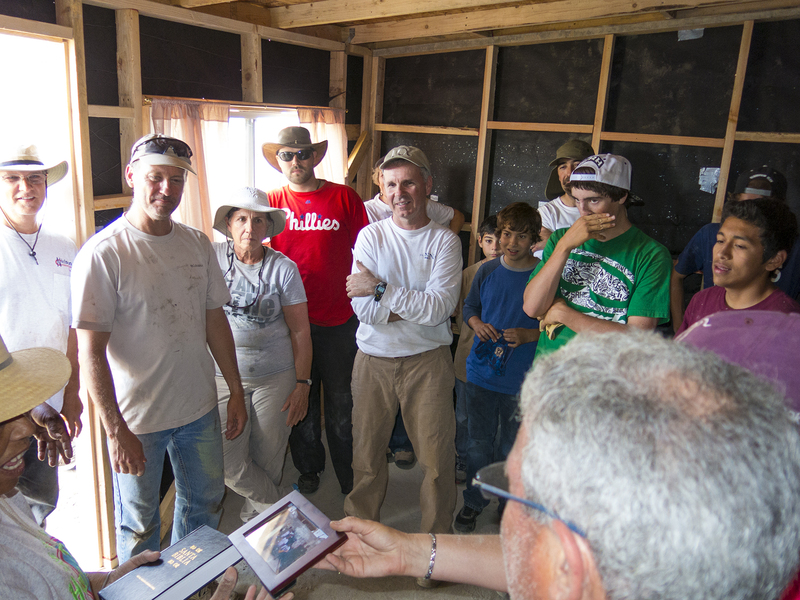 For eight of the past nine years, our Solana Beach Presbyterian church has done a mission trip, building homes for struggling families across the border in northern Baja California. 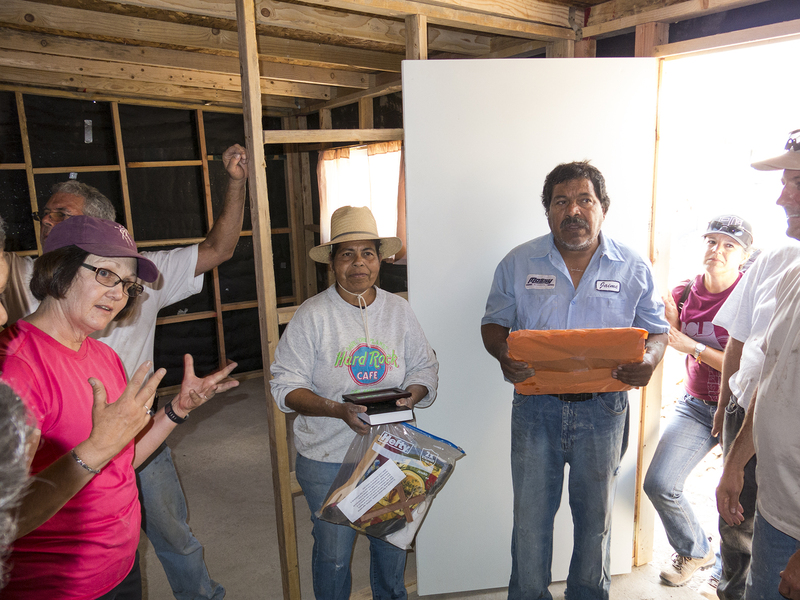 Known within our church as Come Build Hope, and accomplished in concert with Amor Ministries, which provides the logistical support and building materials, it is always done over Memorial Day weekend. 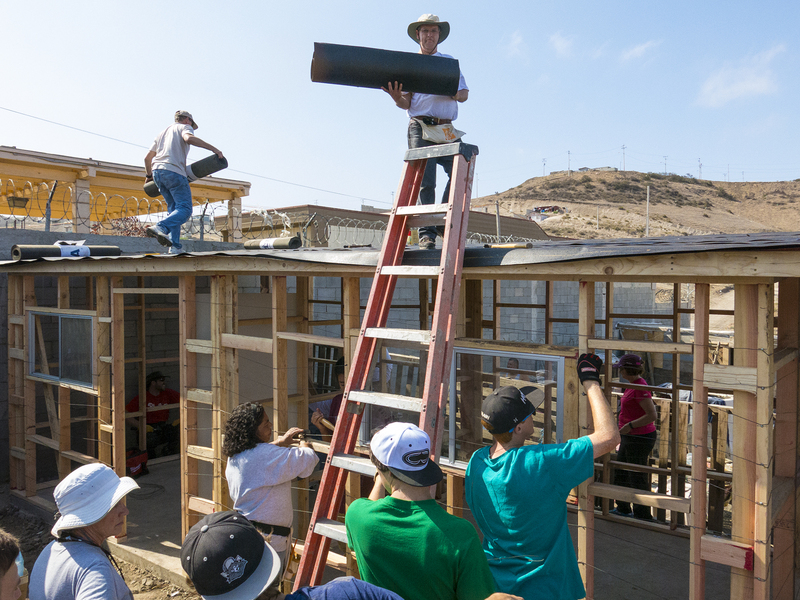 This year was Cathy’s and my second wade-in, and Solana Presbyterian fielded 315 of us from throughout San Diego County and as far away as Colorado to construct 15 homes. Our building subgroup numbered 19, I think—three women, seven adult men, seven male teens/young adults, and two elementary school boys. The two-room home we were slated to build for Maria Guadalupe (Lupita), her husband Ezequiel, and her brother Jaime, rose up on the back of a tiny lot they owned in the hills overlooking Rosarito Beach, located in the Libertador (Liberator) neighborhood at the dirt street intersection of Armageddon and The Savior. You can’t make this stuff up. 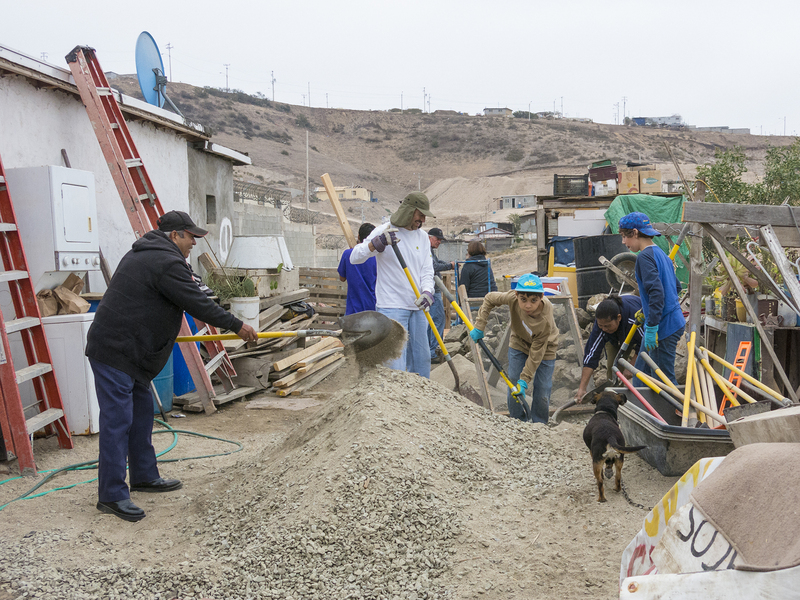 Amor Ministries, headquartered in San Diego, works with Mexican churches and community groups throughout the border region to identify and vet families in need of assistance. 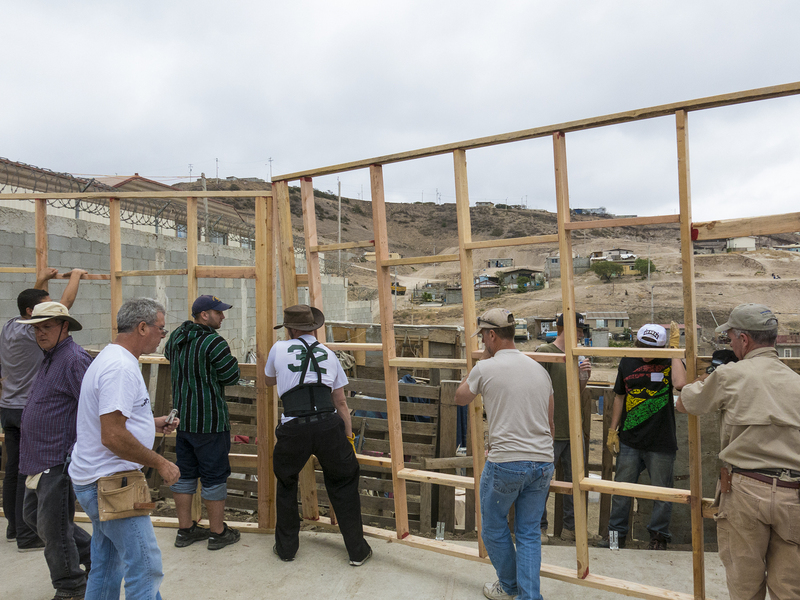 As one of many examples of Christian outreach our church enacts worldwide, Solana Beach Presbyterian signs on to provide X worker bees like us to give our time, funds and energy to turning simple plans and a pile of two-by-fours, plywood, wire, paper, windows and stucco into two-room homes the recipient families can call their own. 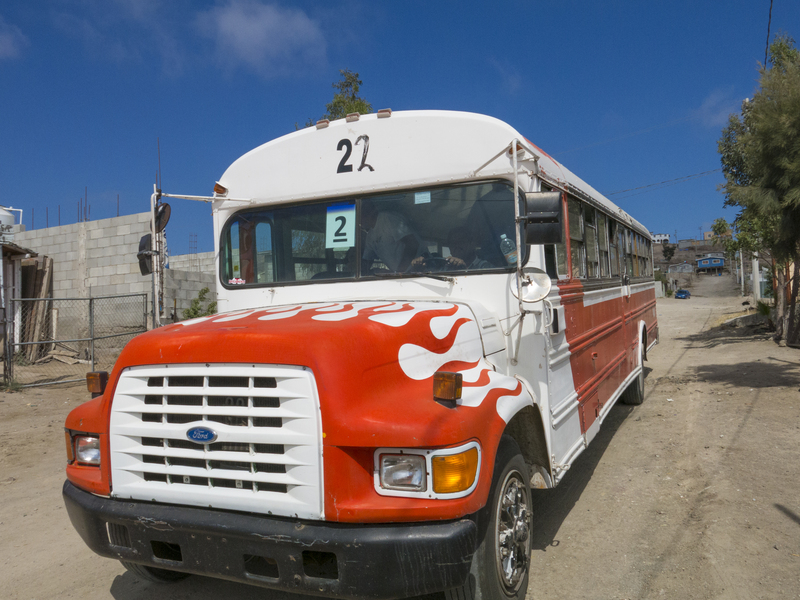 On Friday, we met at the church and were bussed to a dusty open field campsite just east of the toll road from Tijuana to Ensenada. In a logistical tour de force an Army brigade could be proud of, our names were on a list informing which of the hundreds of already erected tents would be our sleeping quarters, our bags and personal tool kits were stacked on a ground cover between our subgroup’s tents, surrounding a pile of firewood, a shovel to dig a fire pit, and folding chairs we could use to encircle the fire after a great Mexican food dinner. Fellowship time. Time to learn about the old friends and strangers with whom we would spend the next two days living out what we see as fulfillment of God’s plan for truly loving thy neighbor. Enjoy this quiet time of sharing and contemplation, because tomorrow morning we all hit the ground running. The Amor rooster assures a predawn wake up, so that you’ve time to make your brown paper bag lunch, eat breakfast, and board the busses for your 8 AM transport to the job site. 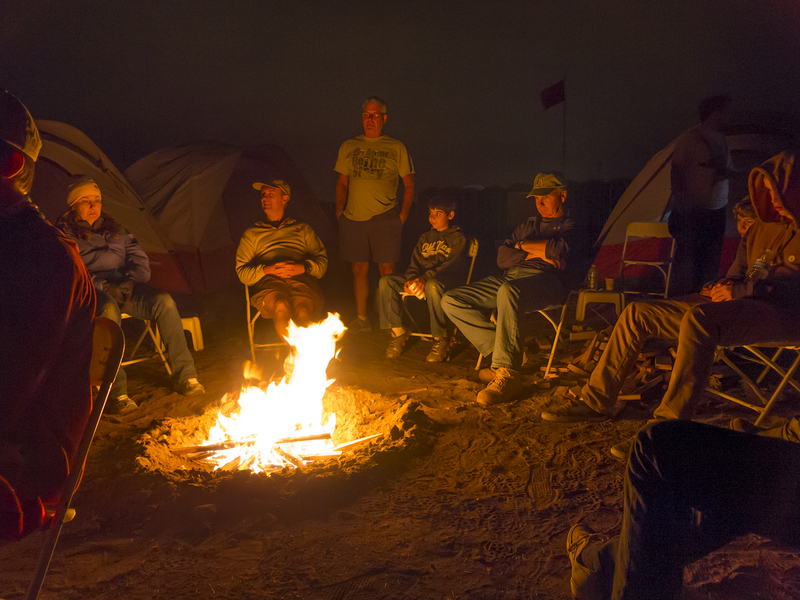 We began with toting our tools off the bus that drove us up into the hills of the colonia, setting up the water jugs, and then gathering for a prayer and a giving of thanks for the bounty in our lives. Our foreman, Dan Salzman, a church and airplane friend of mine (Inspector of Aircraft for the mechanics at High Performance Aircraft), quickly determined that the concrete pad Amor had pre-poured on site was a true rectangle vs. a parallelogram and relatively level. Then he asked the family where they wanted the two windows and front door of their home. That accomplished, he and the assistant foreman, Kent, an architect and builder, split us into two subgroups to start building the front and rear walls, and building the side and interior walls, which are sloped to give the flat roof the necessary angle to achieve runoff in a rain. 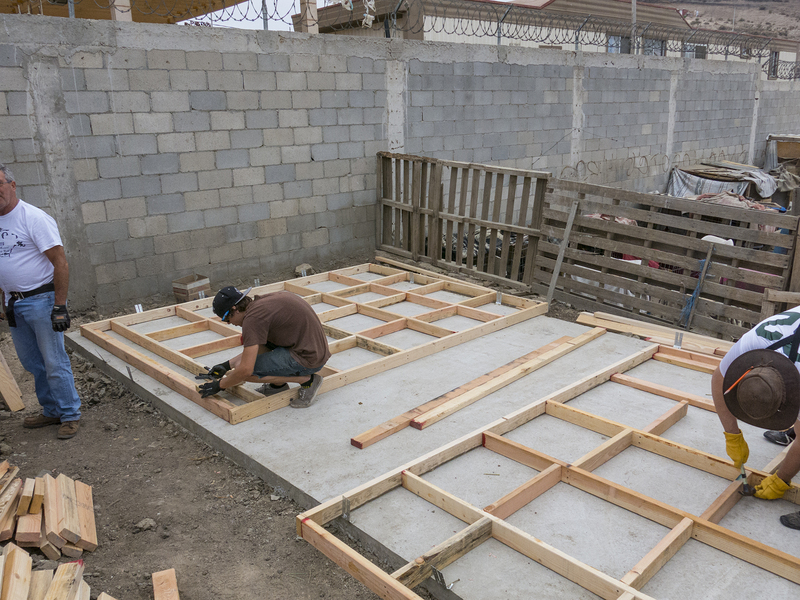 Our pile of two-by-fours were in 8′ and 12′ lengths, and each group foreman got us separating the lumber and headed to our two hammer and nail spots—on the dirt of El Salvador out front, and my group forming the front and rear walls on the slab, itself. 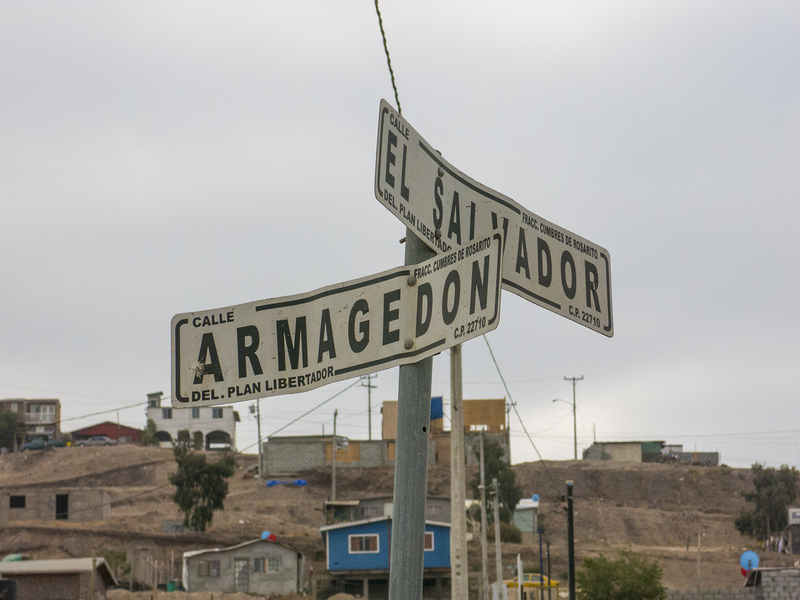 Meanwhile, Sergio—an Oceanside resident originally from Monterrey, Mexico, and our nominal interpreter, with liltingly accented English on a par with Ricardo Montalban—got his two sons, Sergio Jr. and Samuel started in shoveling the gritty sand pile through a wire strainer. That assured the stucco mud we’d be applying next day would be pebble-free. Embracing the sweat-equity concept, they were quickly joined by Ezequiel and his wife, Lupita. 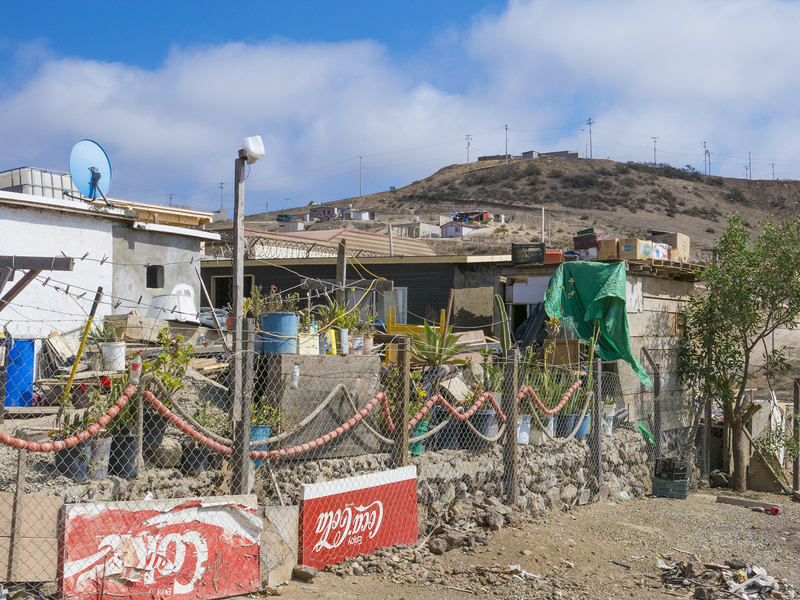 Let me share a brief bio of our family—Ezequiel and Lupita, and Lupita’s brother Jaime, currently living in the tiny cottage you see on the left, above. Ezequiel is a packer and the breadwinner with his $62/week income, and Lupita takes care of the house, and cares for Jaime, who is developing dementia. Both she and her brother have diabetes. The home we were to build was to give them a bit more room for their unique family dynamic. Things to note in the picture, above—nothing is wasted. If they happen to come upon some societal detritus, like a washer/dryer, they carefully husband it, even if there is no running water or sewer in the colonia. And all three of them were immaculate in their dress, pants ironed to a stiff crease, shoes polished, the whole bit. No one in their neighborhood is buying pre-distressed jeans, I can assure you. Dan, on the left edge, and Jordan and John measuring and hammering. I had bought a nifty short crosscut saw at Home Depot, and was routinely called into measure and cut duty to produce the proper lengths of studs and cross braces. Then we worked in small groups of two and three hammering together the two-by-fours, and constantly remeasuring the framed wall, corner to corner, to assure us that it was staying square. 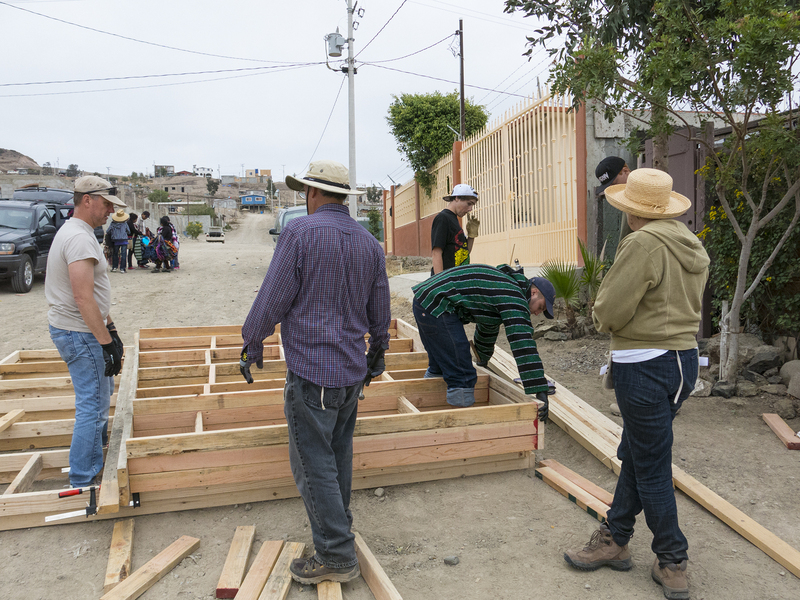 Meanwhile, Kent’s group of Paul and his son Joshua were well into building the three sloped walls out on the street, with Deborah looking on. Paul is a retired Navy P3 pilot from Coronado, and Josh is a student at Texas A&M. Deborah happened to find out about Come Build Hope when she came to Easter Service at our church. 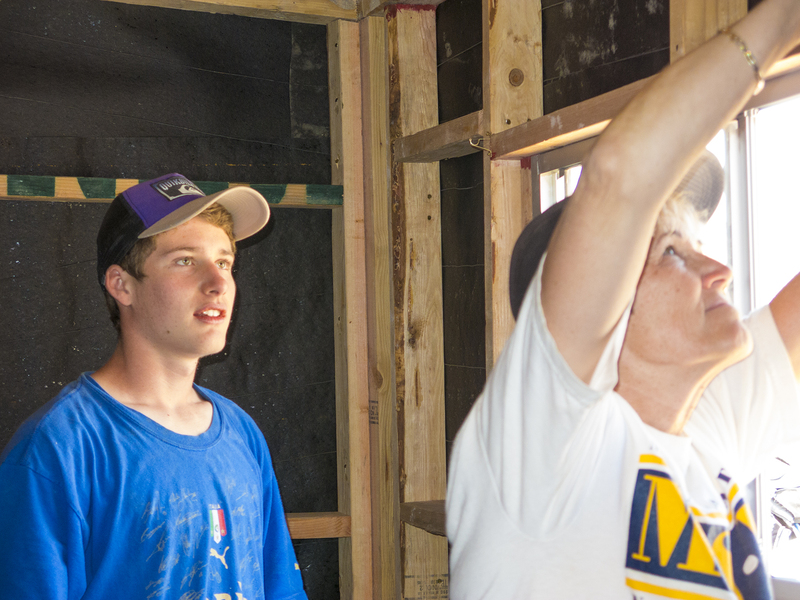 She brought along her son, Connor (backwards ball cap) and his friend Cameron, both hard-working sixteen year-olds. Taking a drink break I wondered what Paul was doing, sawing his studs on edge like this. He marked the top of each vertical stud with the angle of the roof slope so that the top plate, and eventually the roofing plywood would sit snugly. We had no sawhorses or miter boxes. For safety and because of the lack of adequate power, no power tools, either, except Dan’s battery hand drill, used for the door hinges and handle. 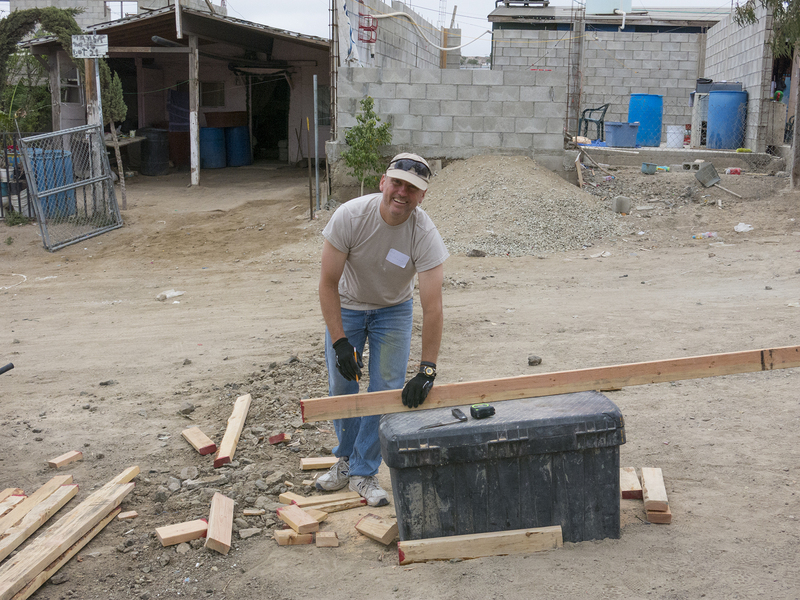 Paul is using the tool box provided by Amor as his support, the other end of the wood supported by the growing walls in the image above. Dan and Kent kept us all cracking, augmented by personal initiative when one could see a job that needed to be done. Various activities were being done simultaneously all over our tiny site, and using whatever we could find to get the job done. Dan and Sergio set up the front door just off the street, and measured and marked the placement of the hinges. 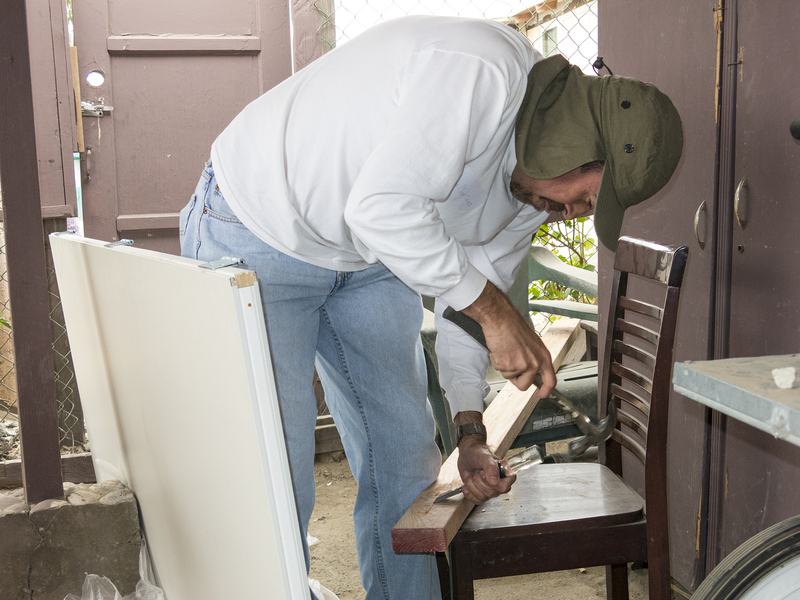 Then Dan headed off to continue assisting the rest of us while Sergio chiseled the recesses for the hinges on the door frame that will eventually be hammered in place. Then those walls get hoisted into place, to be nailed together and strapped down with the steel connectors that had been installed in the slab when it was poured. Amazingly, no blue fingernails at the end of our project, but lots of tired hands, stiff backs, and aching hamstrings. The roof was added in the afternoon of the first day, with sheets of plywood nailed securely to the tops of the walls. The crew was reminded of the importance of watching where they placed their bodies before everything was nailed in place, and also to be very deliberate about laying down any hammers, as others of us were working directly below them. On Saturday morning, the roofing material was applied, and the seams and roofing nails all sealed with caulking. Then the roofing material was rolled over the edge and additionally secured with end strips. Kent, Joshua, Paul and Jordan (a music production student at Southwestern College) left to right. Jordan’s shirt pretty much conveying the spirit of the weekend. Paul, hammering in the end strips. Note the view, above, not that we ever took the time to drink it in. 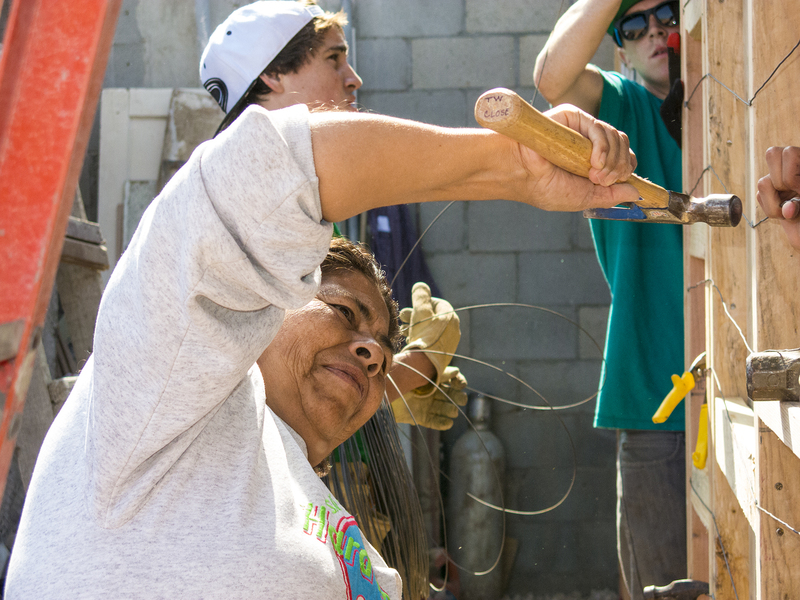 Lupita, having borrowed Cathy’s hammer, is securing bailing wire that encircles the framed house about every six inches vertically. I think that’s Tomas’ hand holding up the wire before Lupita nails it in place. By pulling the wire up on one stud, and down on the next, then nailing it taut in that zigzag, a great deal of tension is placed on the structure to give it rigidity. The wires all sounded about C sharp when strummed. 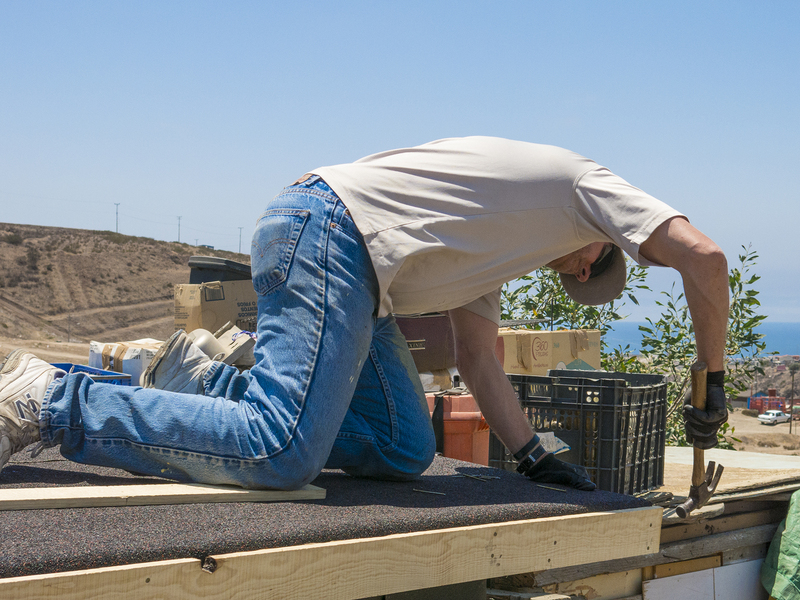 This is also an essential step for getting the tar paper to lay snugly flat against the walls for when the stucco would be shortly added. 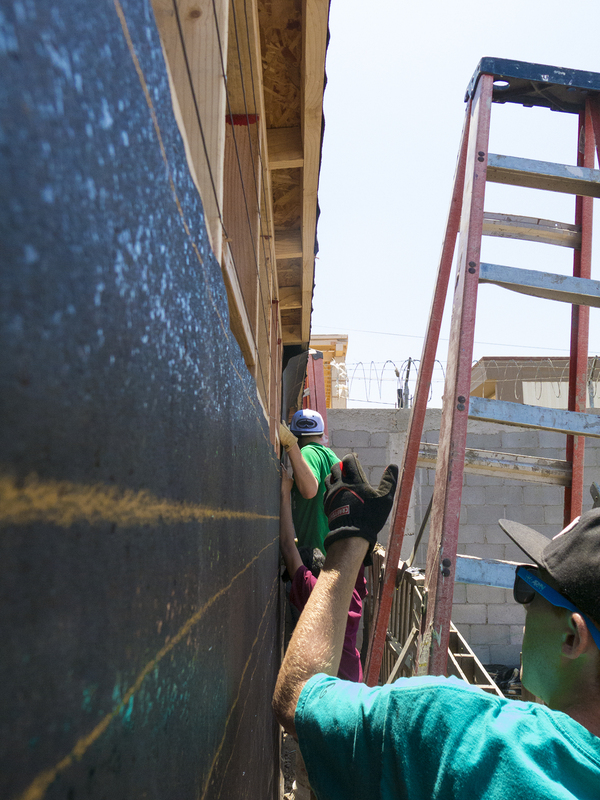 Urgently working to stay on pace, Tomás and Misael, high school students from the Hispanic population of our church, were spreading the lower layer of tarpaper, while on the upper reaches of the back wall, the last of the bailing wire was still being made tight. Now, you need to understand how this was no simple task, given the confines of the site. You can see how close is the block wall belonging to the home next door behind the lads. There was only enough room for the one-at-a-time shoulders of a single person on three sides of the house, and room for about two people on the remaining, front side. This lack of maneuvering room had us constantly adjusting and wriggling sideways past one another. Teamwork. Cameron, Tomás and Connor trying to find a way to use our two ladders to wriggle up and attach the top layer of tarpaper, while simultaneously notching the paper to fit snugly around each roof joist as it stuck out from the walls for the roof overhang. The property line “fence” on the right is actually equipment crates, laid on end and barely held by a couple of flimsy stakes from falling over into the neighboring yard some eight feet below. 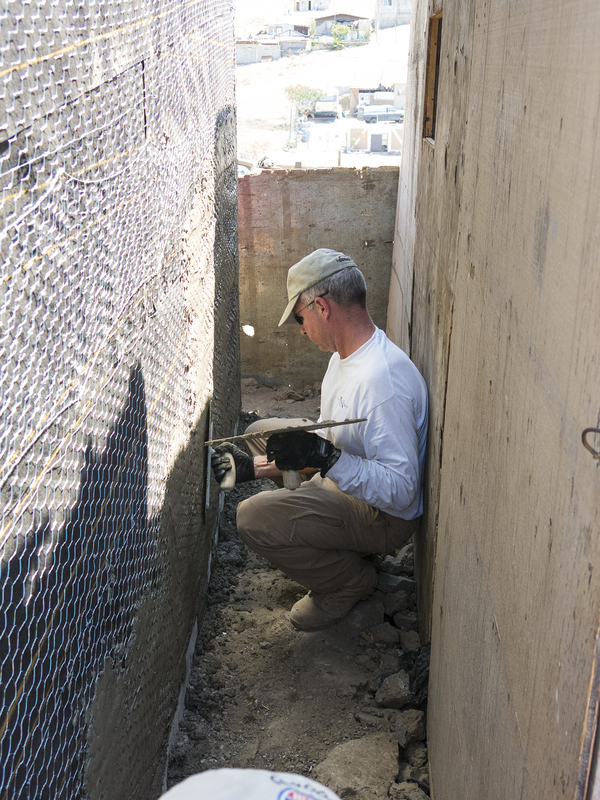 Next comes the chicken wire, which is the substrate upon which the cement/stucco “mud” will be applied. The chicken wire is strung in one continuous roll around first the bottom, then secondly around the top. Here, Sergio, who always got the stretch jobs because of his body height, and Dan are hanging the wire from nails in the wall’s top plate, and Glen, who came as reinforcement from another, less minuscule job site with more workers, and thus more rapid progress, is holding up the unwieldy column of wire, while Kent is working on the door frame. Glen is a high-schooler who selflessly gives to others—he’s been on multiple Come Build Hope builds, and has accompanied our SBPC team four times to work with the Afar people in Ethiopia. Once the chicken wire is nailed along its periphery, it is stretched with small hand lengths of PVC pipe over nails seemingly too far to reach, and then another, unique one-turn corkscrew device tightens it even further by grasping it and securing it on itself, eliminating any vestiges of slack. 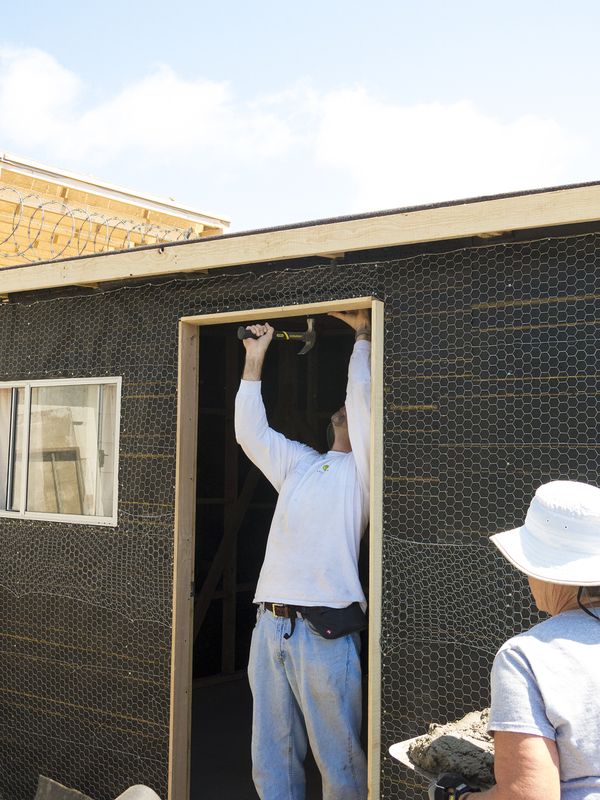 Windows and doors create special challenges for installation of the bailing wire, tarpaper, and chicken wire. 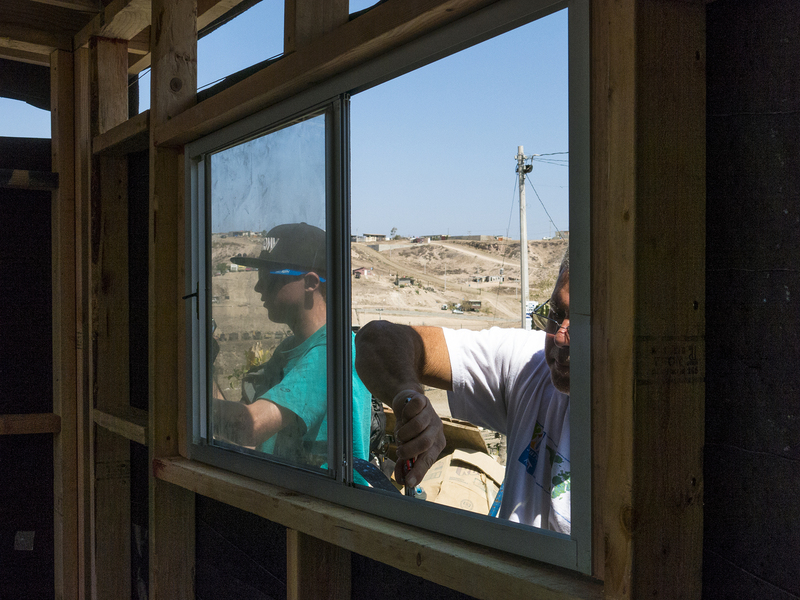 The window has to fit snugly in place, and the interface must include waterproofing with the paper, and eventually with the mud. Here, Dan is securing the chicken wire along the lower edge of the window, while Cameron is using the PVC “tool” to stretch the wire heading toward the nearby corner of the wall. 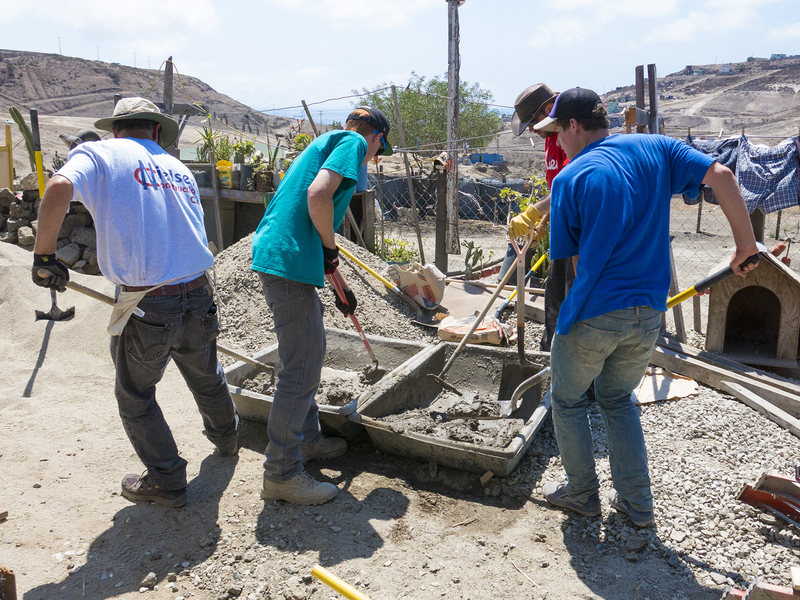 Now, in the afternoon of our last day, it’s time to start mixing the mud, using cement, and the sand that Sergio Jr. and Samuel had filtered through wire mesh the morning before. Everyone has a job, and every job is necessary to arrive at the finished product. Here, Kent, Cameron, John, and another young lad from Glen’s site are mixing in the water to get the correct consistency—not unlike oatmeal going a bit stiff. Have you ever wondered about the term “hod carrier?” Cathy, scurrying along with a heavy hod of mud to be applied along the back and east side walls by the high schoolers, and Lupita and Jaime. Sergio nailing in place the top portion of the doorjamb, which I had just finished sawing to the precise dimension needed. Incidentally, Amor has this construction stuff really fine-tuned. There are enough materials if the foremen assure our being careful. 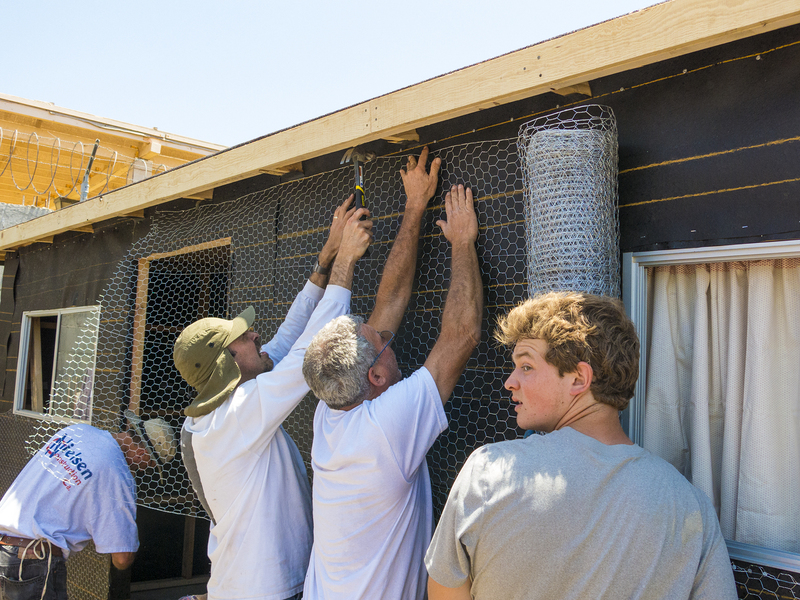 We finished with “excess” of half a loop of bailing wire, a partial roll of chicken wire, a single wheel-barrow of two-by-four scraps, a half a bag each of the three nail types we used, and no extra tarpaper or roofing material. This did not resemble a government cost + contract. 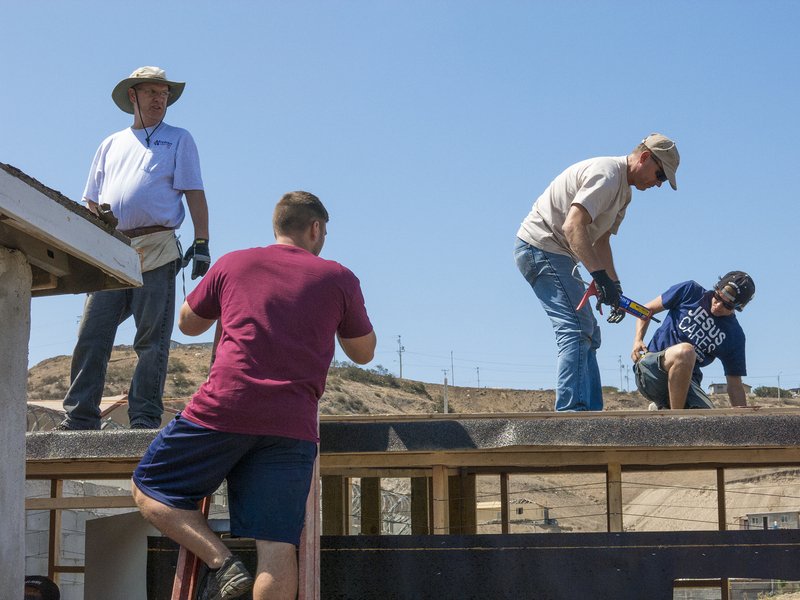 …while outside on the west wall, Jay, another retired Navy pilot from Coronado who joined our team, along with Paul (seen on the very bottom of this image), Joshua, Jordan and Kent, all as outreach from their church across the bay, is busy layering on the mud. What motivates people to pay for the privilege of crossing borders, sleeping on the ground, exhausting themselves and generating aches and pains in muscle groups they didn’t even know they possess, to give up their holiday weekend and create a living space for people they hadn’t met until arriving on site? For all of us there’s the belief that we’ve been gifted greatly, and we feel it’s incumbent upon us to follow the Lord’s motto of giving unto others as we’ve been given to. Of course, there’s the undeniable fact that this sort of mission gives back to us considerably more than we give out, and then at the end, when it’s all coming together that is made manifest in the joyful and loving gratitude of our home family. Lupita is holding a bible, in Spanish, signed by each of us, and given to her along with a group photo taken on our first morning. Dan’s wife, Holly, our group physician, and spiritual spark plug, sharing a prayer of closure, reflecting on the John 15:13 verse that was our byline for our Come Build Hope exercise. (“For greater love hath no man, than to lay down his life for his friends.” A doubly fitting mission motivation, given that this was Memorial Day weekend.) Sergio is dutifully translating Holly’s words into Spanish. Lupita and her brother, Jaime, are holding housewarming gifts, also hand-made by women of our church. We pulled together our tools and stiff bodies, signed the wall stud nearest the front doorjamb, and wished them Amor, Paz, y Familia, trudged out to our waiting bus, and turned to look back on the finished project. Two rooms, two windows, a lockable front door. Secure protection from the elements. And much more that words don’t convey.